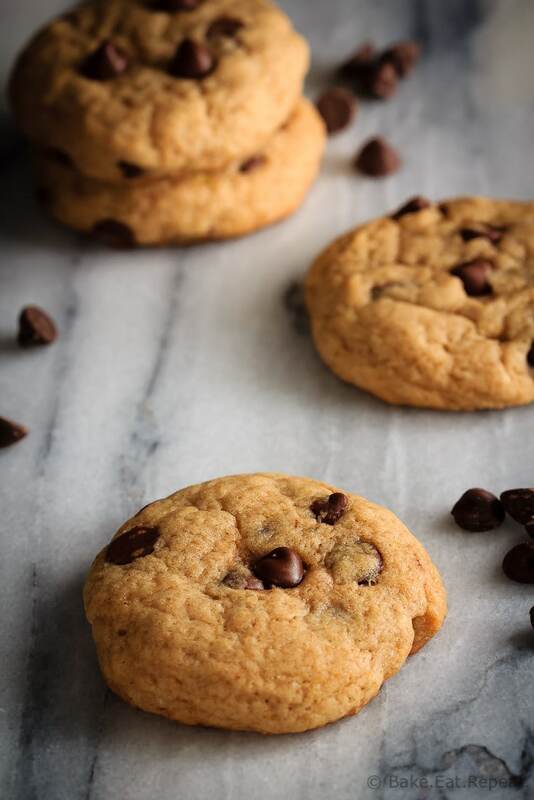 Chewy chocolate chip banana cookies – soft and chewy cookies that taste like chocolate chip banana bread. It’s banana bread in cookie form! Browned butter. Bananas. Chocolate chips. Cinnamon. 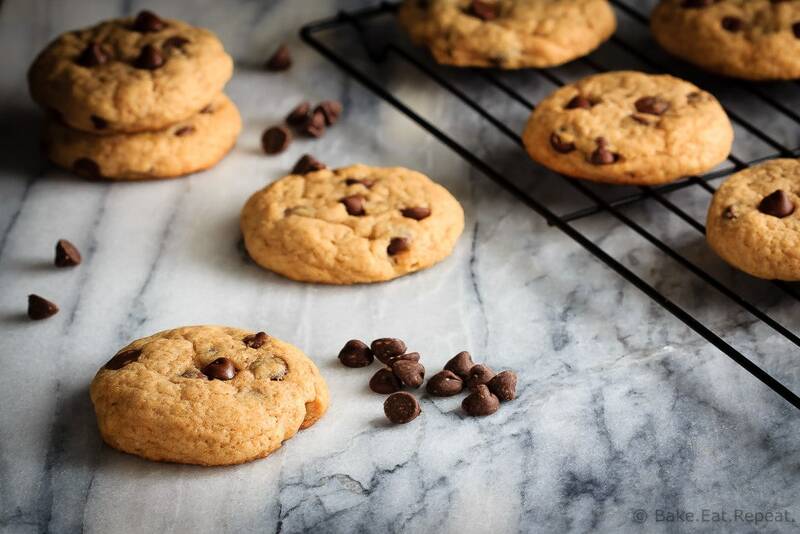 So many good things are going on in these chewy chocolate chip banana cookies. I love banana bread as much as the next person, but if a chocolate chip cookie and a slice of chocolate chip banana bread are both available, I will probably take the cookie every time. Unless it’s early in the morning and I just can’t justify it. We all know banana bread is perfectly reasonable for breakfast though. 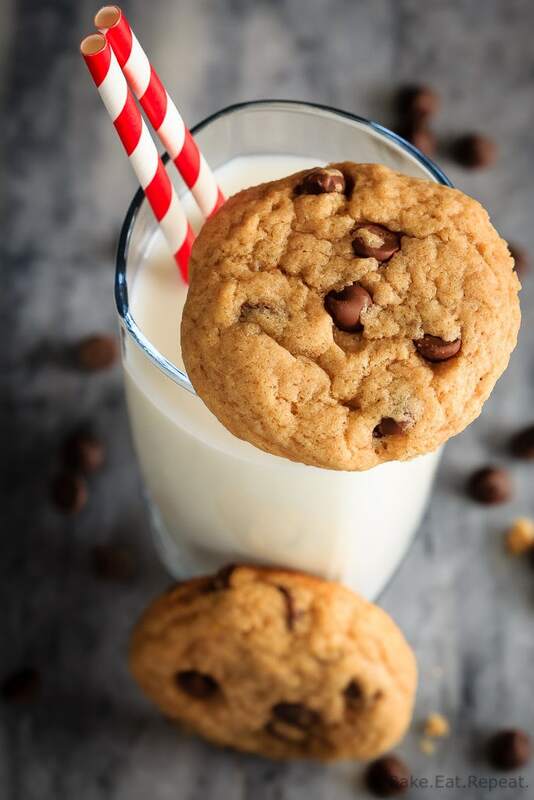 These cookies combine the two into a perfect little treat. I feel like I could even consider these cookies okay for breakfast, just because they taste like banana bread. Now, they’re not even remotely healthy of course. They’re cookies, I’m not trying to tell you that you should have them for breakfast. You totally shouldn’t. I’m saying I could probably justify it to myself. Not that that’s a good idea. Or that I would let my kids do such a thing. Cookies. Chewy chocolate chip banana cookies. Because more options to choose from when you have over-ripe bananas staring at you, begging to be made into something, is always a good thing. I loved that these cookies weren’t cake-y at all (not a fan of cake-y cookies). Even with the banana in them they were nice and chewy. They don’t have any eggs so you could eat the cookie dough if that’s something that appeals to you (not me – but I know I’m in the minority there). And they were fast and easy to mix up and filled with banana flavour – and chocolate chips, of course (after all, what’s banana bread without chocolate chips?). We gobbled up this entire batch of cookies in no time at all. And I didn’t even let anyone eat them for breakfast. 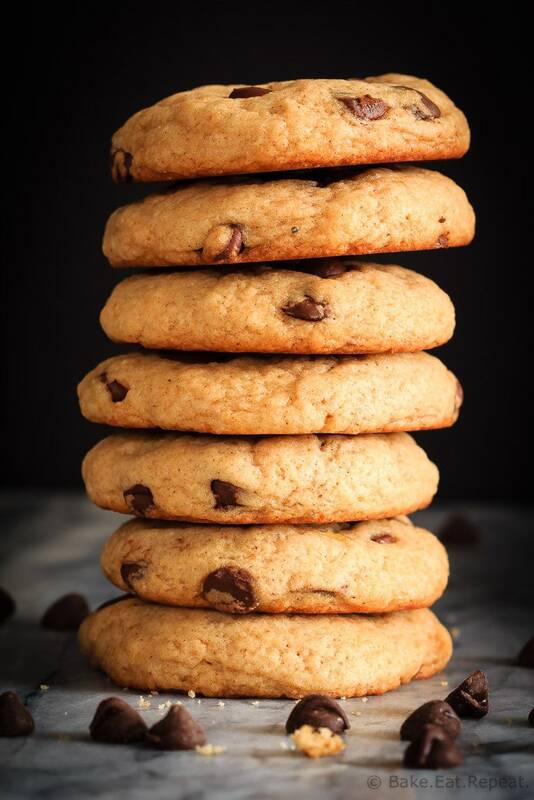 I’ve also shared this Chewy Chocolate Chip Banana Cookies Recipe over on Food Fanatic.